The Outnet, the never ending designer outlet, is one of the best places to get your Luxe for Less. With new items 3 times a week (Monday, Tuesday and Thursday) at upto 60% off, its no surprise that I'm always on the lookout on The Outnet for my wish-list items to crop up. Check out the latest bags in stock, there are some gems to be found... but be quick, some of the items are one offs...and once they're gone, they ain't coming back! 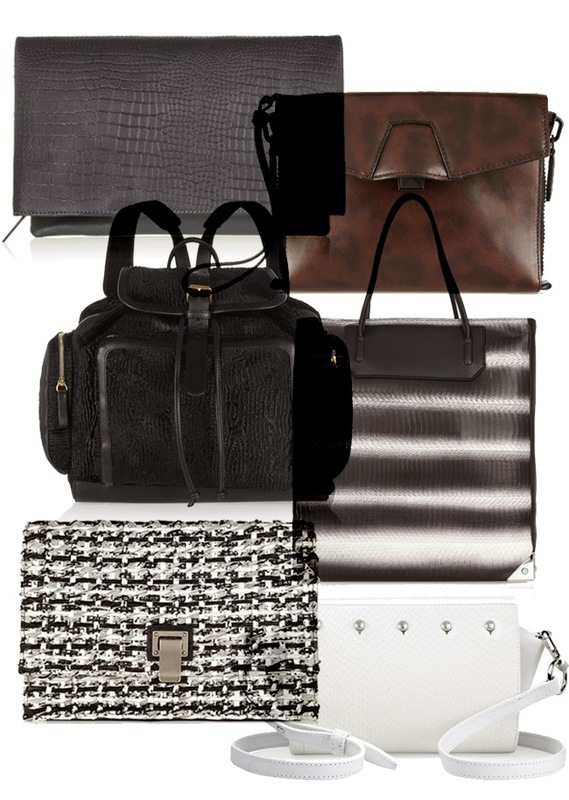 Clockwise from top left: IRIS & INK Hoxton croc-effect clutch, ALEXANDER WANG Lydia leopard-print clutch, ALEXANDER WANG Prisma tote, ALEXANDER WANG Pelican snake-embossed shoulder bag, PROENZA SCHOULER Lunch Bag clutch, PIERRE HARDY Textured-calf hair backpack. Love the bags, alexander wang! Hello from Spain: great proposals.